We are pleased to announce that we will be visiting Jersey in the Channels islands in 2019 for the Friends of SCBU & Jersey Children’s Charity Fundraising Event 2019. This great charity fund raising weekend is being held on Saturday 29th June & Sunday 30th June 2019. The venue being the Royal Jersey Showground, Trinity, Jersey. The day opens at 10.00 am each day with the games starting at 11am. The event promises to be an absolute blast full of fun, water, foam and lots of laughs, and all for a wonderful cause – the precious babies and children in the Special Care Baby Unit and Robin Ward at the Jersey General Hospital. This will be the forth year that we have visited Jersey for the charity and it has always been a great success. There will lots to do on the day including children’s bouncy castles, sideshow, entertainment and food vendors. So even if you’re not in a team, or a supporter of one of the teams they will still be plenty to do, come along and enjoy the atmosphere and the day ! If you’d like more details about entering a team you can either Contact Us or go directly to the charities information page. We’re expecting 36 teams to be taking part each day. As you can see above everyone had a great day and it was also captured by ITV cameras covering local news. So, some along and you might be on the telly! 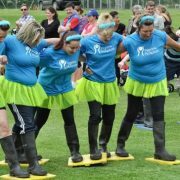 If you’re not on Jersey, but want to join in the fun and take part in one of our charity It’s A Knockout’s please see our Events Page to see other similar events where the public are invited to enter teams. 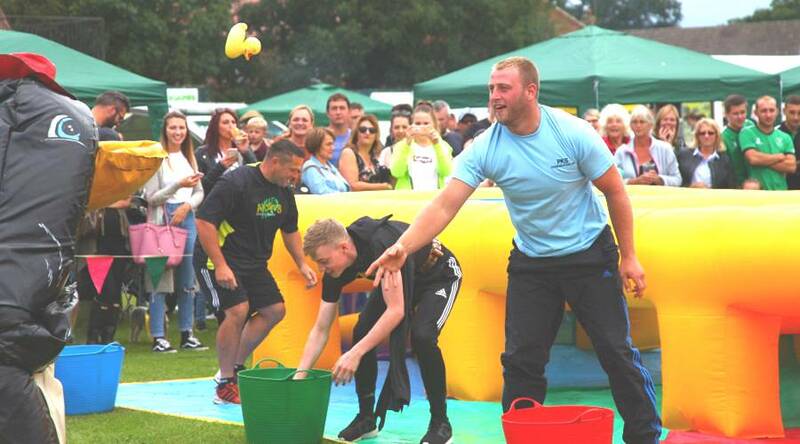 The Denver Family Fun Day 2018 in Norfolk are looking for the public to enter teams into their second It’s A Knockout. This year the family funday is on Sunday 22nd July. 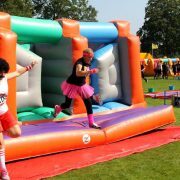 Last years first It’s A Knockout was a great success and they are hoping to re-create the exciting atmosphere this year. 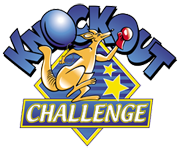 Teams of up to 10 people are invited to take part in the knockout. So if you have some friends or workmates and want to be involved in a great day out, read further and Contact Us for further details. Last year 12 teams from the local community took part over the afternoon event, some coming in fancy dress which was really excellent. Some even brought their own gazebos and decorated them giving the day a nice colourful “Olympic Village” for the teams. Although at daybreak the day started out as wet and cloudy, it soon brightened up as the attractions were being built up. The teams still got wet of course…. well they were taking part in an It’s A Knockout !!! The day starts at 11am, with lots of other family funday attractions, such as fairground rides, a dog show, refreshments and more. You can find more details on the Denver Village Family Funday Facebook page. Come on, be part of the fun in 2018 and get a team together. 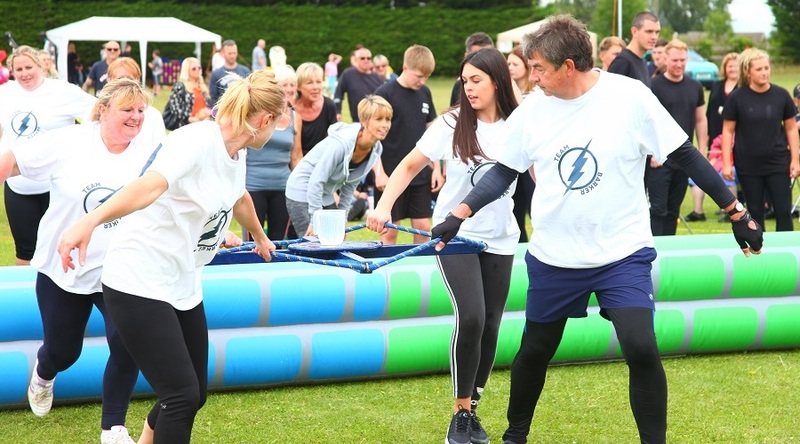 If you are a charity wishing to read further about hosting a charity knockout or are looking into how an It’s A knockout is an ideal arena entertainment for a community event, you’ll find more details on our Charities Page. We have lots of other information to help, just let us know about the aims of your day and we’ll help you as much as possible. Including the Blogging, Tweeting, promotion of the day to help gain interest and exposure. It’s with great pleasure that we invite the public to enter teams into the Pilgrim’s Hospice Charity It’s A Knockout 2018 on Sunday May 20th. 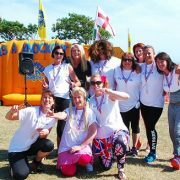 This will be the eight It’s a Knockout held by Pilgrim’s Hospices and the fourth at Government Acre Recreation Ground in Ramsgate. As you can see from the images here that were taken at last years day, it was glorious weather, and everyone had a ball of a time. It’s a Knockout is a fun-tastic way to support Pilgrims Hospice and help them be there for the next family that needs them. It’s a great team builder for work colleagues, family and friends alike, with laughter and fun guaranteed. Join us for a day to remember in an impressive games arena packed full of colourful, inflatable obstacles to contend with – intriguing when they’re dry and definitely challenging when wet! This year we have some new games for you including a new inflatable slide game, a new bubble pit and Kangaroo sumo suits! Fancy having a go yourself? Get your fiends together and enter a team for a great fundraising day. You’ll need a £50 deposit to secure your team’s place and we ask that all teams pledge to raise £500 in sponsorship (just a £50 pledge per person). All team members must be aged 16 or over. Please Contact Us for details of the day. 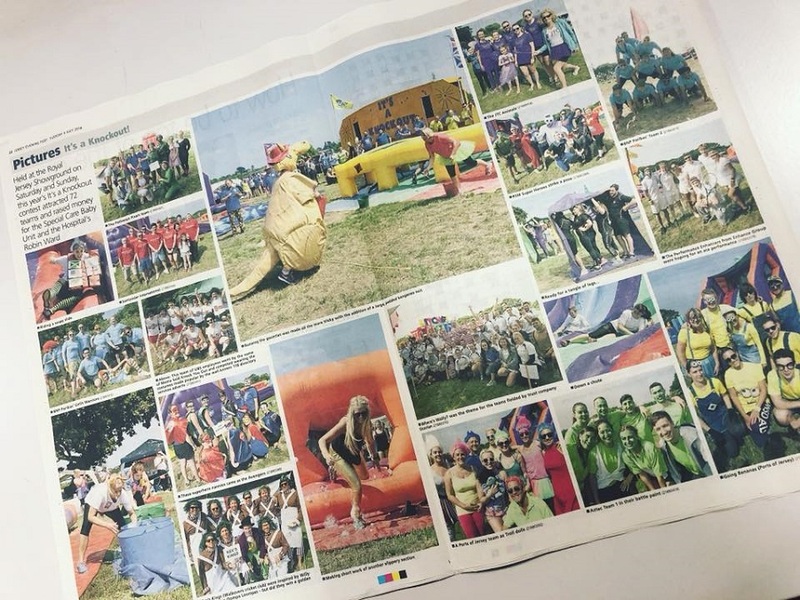 Pilgrim’s Hospice Charity It’s A Knockout 2018. If you can’t make this event, please visit our Events Page for more similar days where the public can enter teams. 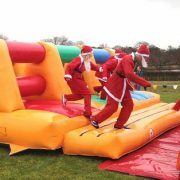 Our inflatables are a great fun addition to a Santa Run course. 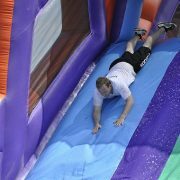 They are best used when placed in a consecutive line, and as you can guess, we have a wide variety of different shaped inflatable obstacles that we can use. The images in this blog were taken as one such Run held in Cambridge this year where 250 fancy dressed Santa’s took part. Our inflatables used as part of a Santa Run. The course was laid out as part of a 5k run (which was twice round a laid out circuit). 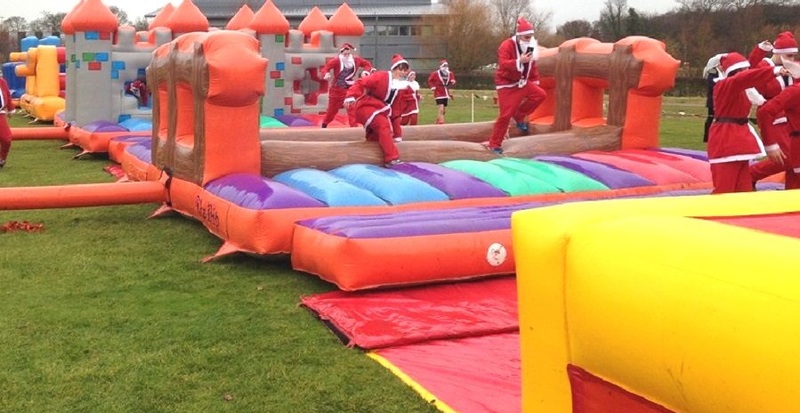 The “Santa’s” negotiated the inflatable course twice as part of their run which was held in aid of a local charity. The course added a great visual element to the event. There was also the opportunity for a Santa Time Trail to find the “Fastest Santa” on the inflatable course. Many charities now hold these events which are a great fundraiser for local causes. Above you can see the Santa’s taking part in their pre-run warm-up before setting off on the 5k course. If you would like details of how our inflatables could be used for an inflatable course, please Contact Us to find out more. 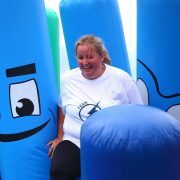 In this blog, we will be talking about the inflatables that we use on our It’s A knockout events. However, as we sometimes get asked about inflatables and safety in general, this will also touch on a few points for anyone hiring bouncy castles or obstacles and a brief explanation of the “Laws” (or official guidance) etc relating to inflatables in general. 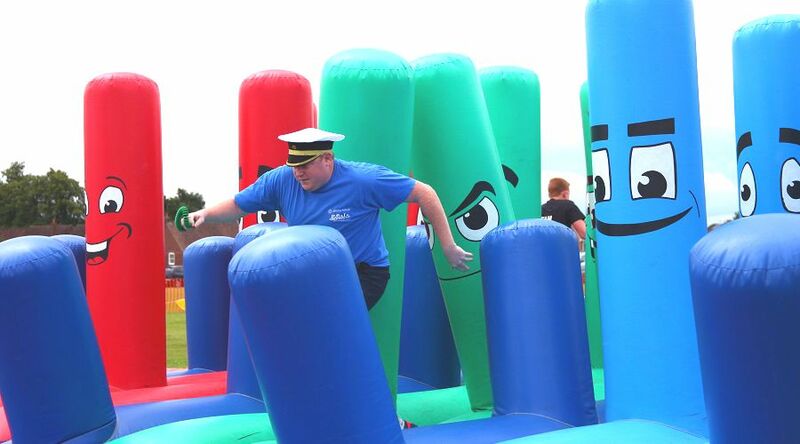 Our It’s A Knockout inflatables are made in the UK to a standard called BS EN 14960. This 54 page EN Standard sets out how inflatable play equipment should be made. It includes details of the materials to be used, the step up and down height for getting on and off them, potential falling off heights, a calculation for the number of anchor points to be included and a lot more such as wind speeds (which I’ll come to later), the angle at which the pegs or stakes to tie down should be hammered in at, plus the size of the stakes and the roping off a safety area around them. Before any inflatable is open to the public for the first time it should be subject to inspections and checks to confirm its design and manufacture comply with the requirements of the BS EN 14960 standard. For operators and hirers, there is also a useful seven page guide called the Safe Use & Operation Of Inflatable Play Equipment, Including Bouncy Castles. It can be found at the ADIPS website. This guide was originally of HSE – Health & Safety Executive – origin and is still considered good guidance for the operators of inflatables. The HSE also stipulates that all inflatables should be tested annually, see the HSE website for details. This, it says, should be carried out by a competent person. To satisfy that we have fulfilled our duty to this, our inflatables are ADIPS tested, the Amusement Device Inspection Procedures Scheme. This is one of only two schemes recognized by HSE, the other being PIPA. Our clients can go to the ADIPS website and “Check a DOC” – Declaration of Operational Compliance – to see if an inflatable has a valid test and can also see an image of the inflatable in question. The annual test checks for, amongst other things, deterioration of the inflatable, the stitching of the panels, air loss (so it holds its “bounciness”), and the integrity of the anchor points. Likewise, for bouncy castles registered with PIPA, a PIPA tag (or test) can be checked on their website. This is a reassuring process for clients and event organisers to able to independently check that a document hasn’t been fraudulently concocted. The EN Standard calls the area where safety mats (or sometimes called “Crash mats”) should be placed around an inflatable as an impact area. These are primarily identified as, but not exclusive to, intended entry and exit points. Our games are designed to predict a manner of participation from the Its A Knockout teams. This helps us to effectively risk manage the games. The EN standard states that at least a 1 inch mat be used, we use 1.5 inch ones for extra care. The inflatable manufacturer or inflatable tester may specifically advise the position of where mats should be placed. This would then be referred to in a Risk Assessment. People ask us whether the rain affects our It’s A Knockout days. Well no, not really, instead of us having to keep a slide wet for an It’s A Knockout game so people can slide down it, Mother Nature is doing it for us. However, wind is a problem. Inflatables made under the EN standard are safe up to Beaufort Scale 6 (which is 25 to 30 miles per hour). This is defined as “Large branches in motion. Whistling heard in telegraph wires. Umbrellas difficult to use”. At this point (25 mph) the use of all inflatables must stop. We have wind meters on each set of games that we use to measure speeds. Our newest ones emit an alarm sound when the speed reaches 25 mph. At the beginning of each event, we point the wind-meter out to everyone present and explain its purpose. We also check the predicted wind speed online at the start of the day to see if wind will be a consideration. Further advice and reading can be found on our About Us page. Event organisers should also refer to the HSE website for Running an event safely. Our clients can log-in to the Client Part of our website and view our Risk Assessments, Safety Certificates, Health & Safety Policy and Staff Training.